Happy New Year! I hope you enjoyed ringing in the New Year with friends and family. It was the first year both our boys stayed up until midnight, so it was pretty special. Crops - my colleagues and I over at Calgary Crops have more fun all-day crops scheduled for you this year, starting with one on January 21st at Montgomery Hall in Calgary! Weekend Retreats - besides our crops, we can't wait to head back to Canmore for more fun-filled weekend scrapbooking retreats in February and November! Workshops - I'll be offering specialty themed workshops at my home throughout the year, starting with a Valentines Workshop on February 3rd! Projects, Ideas and Inspiration - I'll be sharing lots of ideas for traditional and digital scrapbook pages, cards and other papercrafts as often as I can! Newsletter - Make sure you sign up to receive my free monthly newsletter. Enter your email address on the right hand sidebar to be among the first to know about sales, upcoming events and special offers from CM and Me! Rewards Club - join the Creative Memories Rewards Club and receive 15% of your purchases back as product credits! You'll also receive a special newsletter and have access to exclusive products each month! Hostess Specials - because I do a lot of workshops and retreats, it's easy to forget that Creative Memories offers wonderful host rewards for getting friends and family together for a Photo Solutions Party. You can earn free products, 1/2 price product bundles and exclusive thank-you gifts. And CM parties aren't just for scrapbookers...if your friends and family members take pictures, Creative Memories has solutions for organizing, preserving and sharing them! I would be happy to help them with all their photo solution needs, so contact me if you would like to "party"! So much to share...and since this is Creative Memories 25th anniversary year, I am betting there is so much more to come! I'm off to familiarize myself with CM's programs and new products, and I'll be back tomorrow to share my favorites with you. 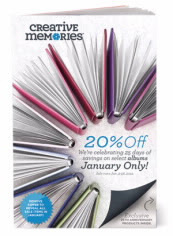 But take a peek at this new January February Mini-Catalog to see what YOUR favorites might be!